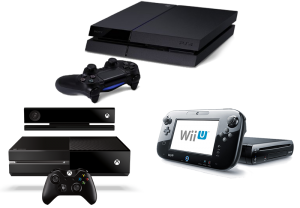 We provide console repairs such as XBox 360 or XBox One, PS3 or PlayStation 4, Nintendo Wii or Switch and more. Our console repair UK also offers Xbox and Playstation Controller repairs, we can fix them all. All our services come with warranty, free prepaid shipping label and a No Fix No Fee guarantee. The device’s screen is cracked? Some consoles were designed to allow customers to play on-the-go. With a portable device that is more efficient than a smartphone, it is understandable that the device will have its fair share of damage, especially when it comes to the screen. Either when transporting a console or when in use, there is a multitude of scenarios that can occur to cause your console screen some damage. If your screen has been damaged, you will definitely need to have it replaced. If there is no immediate physical damage, you may need to check and make sure the device is turning on. You may also need to check if the touchscreen is working. If not, you most definitely want to take your device to a professional to have the screen replaced. Have you learned that your PS4 is out of warranty and will cost an arm and a leg to send it off to a Console Repair UK? Did they mention it could take up to 6 weeks to complete the Playstation repair and send your console repairs back? It’s ridiculous… we agree. That’s why we are here to help you get back in the game! If you’re trying to decide which console repair company you should trust to fix your Playstation YLOD / flashing red light, overheating, blue ray drive, YLOD or other problem, you can be assured our support team at Electronic Partners knows precisely what your PlayStation needs. PS3 Blinking Yellow / Red Light – YLOD PS3 Power Supply Replacement PS4 Lens / Drive Replacement or just an HDMI Port Repair / Replacement or Fan Upgrade we offer a free collection service nationwide. Whether you’re using your PSP for gaming, music, browsing the web or watching a movie, the parties over when your PSP stops working. Electronic Partners is the most recommended PSP console repairs centre in the UK, offering quick, reliable repairs and unbeatable service. If you’re trying to decide which repair company you should trust to carry out your PSP’s LCD replacement, housing, button or joystick repair, UMD disc drive repair or any other problem, you can be assured our support team knows precisely what your PSP needs. We offer PSP 1000 LCD Replacement PSP 2000/3000 LCD Replacement PSP Case / Housing Replacement PSP Button / Joystick Repair PSP UMD Disc Drive Repair PSP Motherboard Replacement and free collection service. Affordable Xbox 360 & Xbox One Console Repair. Looking for a fast affordable solution for your Xbox console repairs? We handle hundreds of Xbox One and Xbox 360s every day. We handle most repairs the same day you accept the quote. Meaning we can have your system fully repaired and warranty covered within the same day we receive it. Our customers appreciate the worry-free fast reliable service.If you’re trying to decide which repair company you should trust to fix your XBOX’s RROD repair, drive repair or cooling problem, you can be assured our support team knows what your XBOX needs. Though the Nintendo Wii does not have as many issues as some of the larger video game consoles, it is definitely not without fail. Common Nintendo Wii Console Repairs include – stuck disc, cracked casing, and objects not made for the Wii inserted in the console. The problems that commonly occur with handheld portable game consoles can be a pain. Most common Nintendo Console Repairs being the cracked screen from dropping the handheld console. These are very delicate repairs as the parts are very small. We have mastered the handheld repair industry through hi-tech testing and tools. We are highly skilled at diagnosing and repairing every brand of Gaming or Android Console like OUYA. From a simple screen replacement to a major motherboard operation, we do it all! Expert non-warranty Gaming Console services UK wide. …specialised in Gaming Consoles made by xbox1 … Almost all of our Elite Controller Repair SUTTON COLDFIELD are processed within 3-5 working days while also offering express repairs. Expert non-warranty Gaming Console services UK wide. …specialised in Gaming Consoles made by Ps4 … Almost all of our Ps4 HDMI Port Repair Leicester are processed within 3-5 working days while also offering express repairs.